On a recent Career Exploration trip to Los Angeles, students met with UW alumnus Peter Clarke and colleague Susan Evans. The time spent with this dynamic duo of researchers showcased how students can leverage their degrees to open doors not only for themselves, but for underserved populations. Clarke and Evans demonstrated their mobile app, “Quick! Help for Meals,” intended to improve the diets of low-income families. 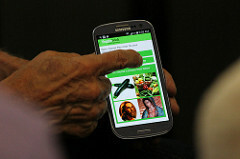 The app, featuring a “VeggieBook” and “SecretsBook,” provides users with a customized set of recipes. Armed with new nutrition knowledge, users are more empowered to make rewarding dining decisions. Clarke and Evans believe that the increased consumption of fruits and vegetables, as advocated by the app, will reduce the risk of obesity that affects many low-income families. The user experience begins with a brief series of questions: What vegetables do they want to cook? Are they using a microwave, stove-top steamer, slow cooker or oven? Does the family lean toward particular cuisines and flavors, such as Asian, Hispanic or African-American? Do they need to cook for someone with special dietary needs? The app then generates a digital nutrition guide and set of recipes tailored to each user. Currently, the app contains about 280 different recipes and more than 150 nutrition tips. All materials are available in English and Spanish, and users can print out the booklets or refer to their mobile devices while preparing meals. Clarke and Evans plan to use the data generated by app users to study the effect of both short-term and sustained changes in diet. Ultimately, they want to determine whether the use of their app improves markers of obesity, such as body mass index and body fat.